75060 Slave I is an Ultimate Collector's Series Star Wars set released in January 2015. This is a description taken from LEGO.com. Please do not modify it. 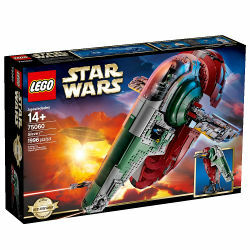 (visit this item's product page) Lift off for bounty-hunting adventures in the Slave I! Track down fugitives with legendary bounty hunter, Boba Fett™ aboard the powerful Slave I! This exclusive LEGO® Star Wars™ model features a rotating cockpit and wings for flight and landing mode, plus dual shooters and hidden blasters to repel attackers. Reenact the capture of Han Solo™ in Star Wars™: Episode V The Empire Strikes Back and take off from Bespin with the carbonite-imprisoned Rebel hero in the cargo hold. Attach the stand to display this iconic ship in characteristic upright flight. Includes 4 minifigures with weapons: Boba Fett™, Bespin Guard™, Stormtrooper™ and Han Solo™. Facts about "75060 Slave I"